We keep one, well-heeled step ahead. We work with a team of superstar stylists to figure out clients’ most crucial, unsolved hair needs. Your top problems, concerns, and wishes—whatever is keeping you from your best hair day—it’s our obsession to know, and our mission to do something about it. We believe every hair concern warrants an at-your-fingertips fix. When that fix doesn’t exist, it’s our job to create it. 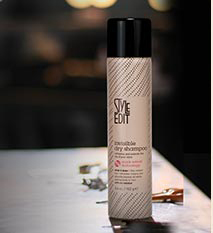 Style Edit brings together the world’s leading scientists and stylists to devise new delivery forms, invent new complexes, and innovate products that you can’t live without. We’re for breaking barriers, challenging conventions, and taking on the impossible… all in the name of fabulous hair. We’re dedicated to achieving salon-worthy hair, every day of the year. Our super-edited collection of problem-solving products are about one thing: results. We can talk about our patents, our molecules and our systems, but it really comes down to giving you your best hair. 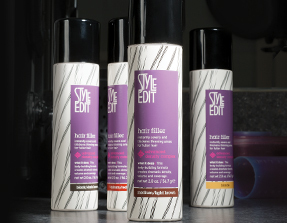 With Style Edit, you’re never more than one product away from the incredible style you want. We believe gorgeous, healthy, look-at-me hair is a universal right. A lot of life we can’t change. But hair, we can. We’re dedicated to the transformative, confidence-boosting, ready-to-take-on-the-world power of hair. We’re dedicated to the great hair day… day after day. We’re dedicated to changing the way you look at your hair, and changing the way you look at yourself. this temporary body-building formula creates dramatic density, volume and coverage. naturally derived fibers adhere to thin hairs making them look fuller and feel thicker instantly. advanced density complex, a blend of natural emollients and cellulose fibers adhere to fine hair to make it appear thicker, creating the appearance of more abundant hair. naturally derived pigments smoothly adhere to the hair fiber and self adjust to perfectly match hair color providing a lustrous, natural shine. 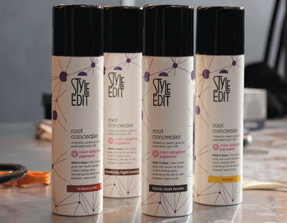 This instant gray root touch-up spray covers fading roots, extending the life of color between salon visits. the unique pin point applicator targets the areas that need a temporary color boost. color adaptive pigments that smoothly adhere to the hair fiber and self adjust to perfectly match hair color, providing a lustrous, natural shine. This instant hair refresher cleans and absorbs excess oil while simultaneously adding body to hair. unique micro-powder is invisible on scalp and hair; won’t leave a powdery residue. because water isn’t needed to cleanse hair, this formula lengthens the time between shampooing, styling and hair coloring. A blend of oil-absorbers and neutralizers conveniently cleans hair without dulling its natural shine. quick refresh technology neutralizes unwanted odors in the hair, leaving hair fresh and looking clean. damage repair technology mimics hair’s own keratin for targeted repair of breakage and split ends that continues to work over time.